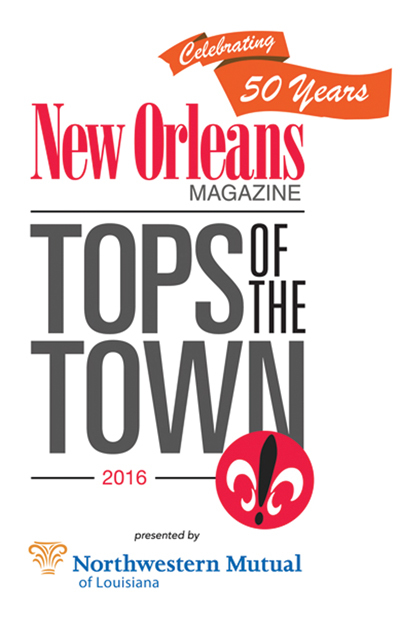 In this, an election year in Louisiana, our readers have been making their feeling known about their picks for the Tops of the Town. There were no mean-spirited commercials funded by Political Action Committees in our voting, no mindless Obama-bashing. Rather, this was just straight forward voting – folks telling us what they think. A couple of things you should know: H To make the list a choice had to have a significant cluster of votes. Places without enough votes were eliminated. H Categories without enough voters were also removed. H Where there was evidence of ballot box stuffing (and there wasn’t much) the votes were adjusted accordingly. H We know that there are some significant places that didn’t make the list, nevertheless we’re confident that those that are listed are all worthy and are among the tops in their field. A Birthday Bash and Celebration of the Top People and Places in Town! DON’T BE A DRAG, DADDY-O… GET YOUR TICKETS TODAY! Endymion will be celebrating its 50th anniversary this year; so, too, will Ed Muniz, the krewe’s founder and only captain to date. Counting organizational time, Muniz’s tenure is probably closer to 52 years, but why complicate it? At 50 years on the job he is, by far, Carnival’s senior captain. Through those years he has also had other jobs, including serving on the Jefferson Parish Council and as mayor of Kenner. No mayor commands as much attention as does Muniz when his parade rolls up Canal Street on the Saturday before Mardi Gras. Carnival’s biggest parade rules the city that night and, at 50, it’s just getting started. Two remarkable reasons… One Smashing Soiree! Angela Hill has made our Tops lists so many times through the years that she should have her own permanent page. Those who have watched her career path unfold have seen her at first as a consumer reporter, then a very popular news anchor and later a radio talk show host. Having retired from the latter this past year, we still see her doing commercials, but her real cause remains animals. She is a pet’s best friend. Hill long ago earned ample reason to be snobby; instead she has remained a genuinely nice person. That perhaps is even more reason why she is still Tops. Already the moment was important on Oct. 21, 2015, when Irma Thomas performed with Allen Toussaint at the Pavilion of the Two Sisters in City Park. Just by the combined presence of the “Soul Queen of New Orleans” and the city’s musical genius, the gathering had historic weight. No one knew that it would be Toussaint’s last performance in New Orleans. The fact that you are not here. Never have those lines meant so much. *Copelands, which specializes in a regional application to local cuisines, was judged by our readers to be both Creole and Cajun. tie 6. New Orleans Hamburger & Seafood Co.
* At press time Spud McConnell is currently not on radio – but should be.